Brighton Marathon on the hottest day of the year? Well what a way to enter the world of marathons!! I was already aiming to run my first marathon this year, and had signed up for Richmond Marathon when I didn’t get a ballot place for London. I was then lucky enough to get a free charity place for Brighton back in January… I very much enjoyed the training, even the long runs in the rain and snow! It was great to get out with other SJs in training, particularly Sophie Le Saux and Ian Watson, who accompanied me on several of my long runs. During the last few weeks of training, I started to suffer with a tight left calf, and was worried I might be injured for my first ever marathon… I missed one of my longer runs towards the end of training because of this, and I immediately sought out a physio appointment! The lovely Dan at Thorpes Physiotherapy quickly put my mind at rest, giving me some exercises to do and some great sports massage. I fully embraced the tapering stage, and kept to gentle, short club runs or runs with my boys during the run up to Brighton. In March I also got involved in some research at Brighton Uni. They are looking at the effect of marathon running on the heart, and wanted runners who were running in the marathon to take part. This involved several blood tests and VO2 Max testing, which was interesting! I learnt that my VO2 Max is 55ml/kg/min and they also advised me what my heart rate and race pace should be during the marathon, which certainly came in handy on the day! They also predicted that my finish time would be a couple of minutes over four hours. On the day I travelled down with my friend and her husband, Iain, who had joined me on a couple of long runs. We arrived at Preston Park with plenty of time to spare, although I still spent an hour in queues for the toilet! Before we knew it, it was time to line up! I had opted to go for the yellow corral, the 4.00 to 4.30 hr start, thinking I could set off at the front with the 4.00 hr pacer.. However, it turned out that the 4 hr pacer was at the back of the blue corral, so I never actually caught up with them!! By the time the red and blue corrals had set off, we had been waiting to go for about 15 minutes, so were all raring to get going when they eventually released us!! Once over the start line, I set off a bit fast, thinking I might catch the 4 hr pacer! Thankfully, I had set my garmin to alert me if my HR went over 148 (the research team had suggested my race HR should be in the mid 40s), so it very quickly alerted me to the fact I was going too hard! During the course of the marathon it bleeped at me pretty regularly, and reminded me to just steady down a bit..
Once away from Preston Park, I settled into the run, and started to really enjoy the atmosphere. The crowd support was absolutely amazing, and once again I made an effort to high five the children waiting eagerly on the sidelines! It soon started to warm up, and I was glad I had brought my little water bottles in my belt! I fuelled as I had done during training, taking on gels every 5 miles or so, with a few Jelly Babies thrown in for good measure..
Once out on the sea front, I started to overtake a few of the blue corral starters.. I kept slowing my pace when my garmin beeped, and just focused on enjoying the whole experience. I was also looking out for my fellow SJs and got a bit excited when I could shout out encouragement at them (sorry all!!). Before I knew it, we had hit the 13 mile mark, and I was feeling good. 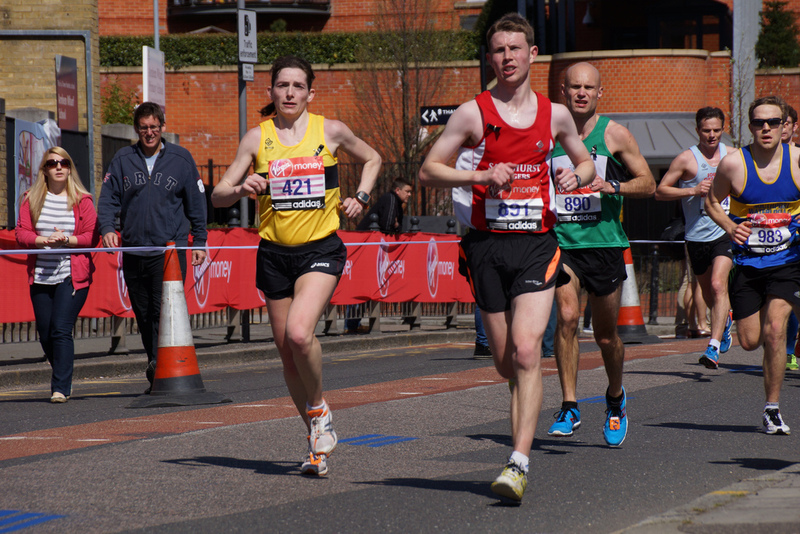 I continued to enjoy the atmosphere and music, but then started to see runners who had collapsed…. Thankfully all of them had people around them, and the St John team were very busy! Otherwise, I think I would have felt obliged to stop and help. Seeing these poor people lying on the road or path, made me feel bad and I realised how tough it was in the heat..
Before long, we started to head out into the port area. I had been warned that this was a very long and dull part of the course, and it would take us from mile 20 to 23. I had specifically packed chocolate in my bumbag, just in case I needed something to keep me going at this point, but I managed to keep going without it.